Make a memorable statement with this raffia tie bookmark! 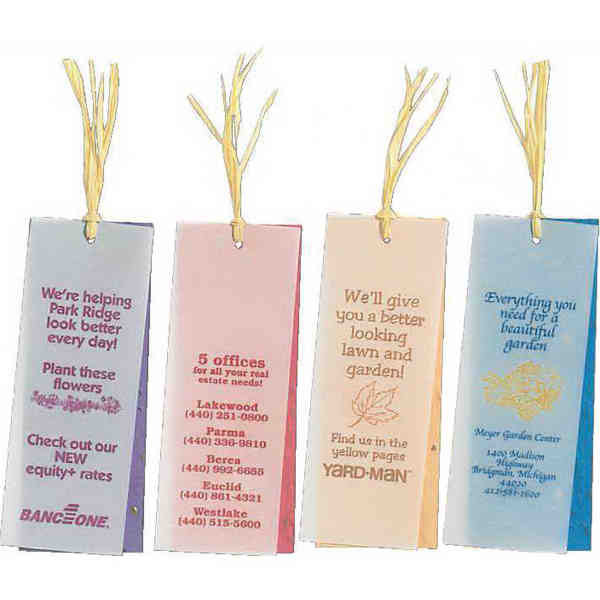 These simple, tasteful bookmarks feature your custom message imprinted on elegant vellum paper in full color and attached to seeded paper with natural raffia tie. Planting instructions are included, along with your choice of colorful flower, herb, or spruce seeded paper. Seeded paper is a natural, handmade product, and colors can vary slightly. Size: 2 " x 5 1/4 "
Price Includes:Full color imprint on vellum paper.